I'm digging into the vaults for this one. Vincent S. Daniel was born in Hammersmith, London, in 1874 and, after training as an art student, was to be found working as an engraver around the turn of the century. 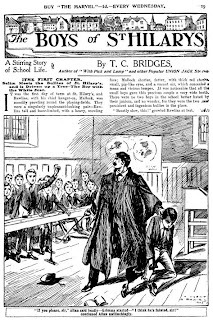 Soon, he became a freelance illustrator, his work appearing in The Story of Jesus for Boys and Girls (Sisley's, 1907) and the "Daily Mail" Sixpenny Novels series as well as story papers published by the Amalgamated Press. The earliest work I have been able to trace dates from 1904 when he began working regularly on Union Jack, shortly before that paper became the permanent home for Sexton Blake's adventures. 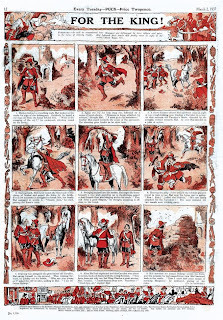 Towards the end of the Great War, Daniel switched from story headings and illustrations to crude but effective adventure strips for the company's penny comics. His earliest known strip work was "Juliet the Office Girl" in The Jester (1917), followed by contributions to Rainbow, Puck, Comic Life, Lot-o'-Fun and Crackers during the 1920s. 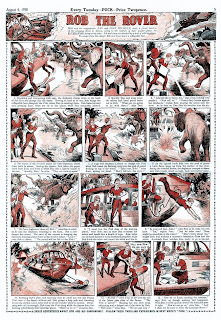 For a period between 1922-24 he took over—from the strip's creator, Walter Booth—as the artist of Britain's first adventure strip, "Rob the Rover", later assisting Booth in the mid-1930s on the same strip as well as taking over "For the King!" and "The Adventures of Captain Moonlight". Solo, he produced many other adventure strips for Puck, Crackers, Merry & Bright and Golden during the 1930s. 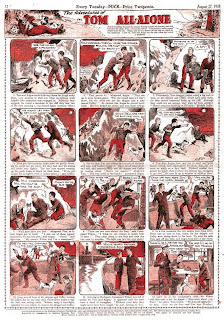 Daniels' career seems to come to an end with the collapse of the penny comics in the early months of the Second World War, although he was still listed as living in London in 1944-45, shortly before his death, aged 71. Daniel was married to Ethel Martha Dixon in 1902 and had at least two daughters, Monica (later Dewey) and Pauline (later Kenway). I've heard that Daniel is said to have owned a farm in Bishops Stortford, Hertfordshire, although the only early (1929) address I've been able to trace is in Leigh, in Kent, and I believe he spent most of his life living in Brentford, London. 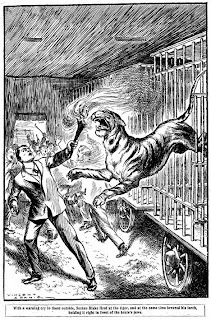 Another, more intriguing, story, told to me by Bill Lofts, was that Daniel's father was a well known card sharper on the London to Brighton race train and Daniel ended his life by shooting himself in the offices of the Daily Mirror. I strongly believe that Bill got this wrong (Daniel's father was an accountant and his death is registered at Brentford)—so who was the artist Bill was mistaking Daniel for? Thanks for sharing info on this unknown artist/creator, Steve. By the way your blogging speed is much more faster than my blog-hopping time pass... So excuse me if I miss out from commenting on all posts... but rest assured I would be here to pitch in whenever possible.